Working with Chicago’s Best and Where’s Lisa? Bittersweet's Judy Contino, Hearty Boys' Dan Smith, NAHA's Carrie Nahabedian, BOKA's Giuseppe Tentori and even cast members from the run-away-hit musical Jersey Boys. It’s a rare chance to check-out some fantastic cooking demos, and explore the largest science museum in the Western Hemisphere. If you can’t make it to the Museum, please visit me at another one of my classes, many of which are free. Remember, who says you can’t eat well with food allergies??? Today is my 40th birthday, I can’t believe how time has flown. I will soon be celebrating my 2 year anniversary of finding out about my food allergies, which is a birthday of sorts as well. I have truly enjoyed learning and sharing how to cook, shop and dine allergen free and hope the recipes and products on my site have added to the quality of your allergen free lives. Please let me know if there is anything you would like to see, I know I don’t do a lot of baking, but am feeling the itch to dig in and figure out the secrets of a perfect cake, pie or crusty piece of bread, stay tuned! In the mean time please enjoy this yummy chicken dish with a touch of sweetness - your whole family will be asking for seconds. Place pancetta on baking sheet and brush with maple syrup. Cook pancetta until crispy, about 15 minutes, set aside to cool. Pre-heat a large sauté pan on med-hi heat for 1 minute, add olive oil and heat another minute. Sprinkle salt and pepper over both sides of the chicken breast. Sauté chicken until about 2/3rds of the way thru, you will notice beads of sweat start to form on the top of the chicken breasts. Flip chicken and add onion, sauté 4 minutes. Add balsamic vinegar to deglaze pan for 1 minute. Add maple syrup, chicken stock and Dijon mustard & reduce liquid by ½. Return chicken to pan to reheat. 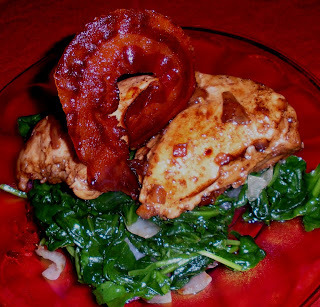 This dish is wonderful with sautéed spinach as the base (see recipe below) and then chicken topped with pancetta. Add sauce to plate around food. Take large saute pan and heat over medium high flame. Add olive oil and let pan heat another minute. Add onion and cook until translucent, don’t brown. Add spinach and cook until desired consistency. SAFE & SOUND DINNER AT DA LUCIANO’S SPURS ECONOMY – New clothing needed after enormous, allergen-free Italian feast! 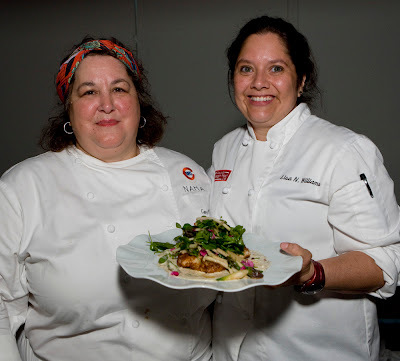 Da Luciano’s owners Rose & Luciano Ignacio went above-and-beyond the call of hospitality at our recent Safe & Sound Dinner on September 12th at their popular River Grove restaurant. We started with their incredible brushchetta, eggplant parmesan and pizza appetizers, followed by homemade minestrone soup, and then platter after platter of Da Luciano’s signature entrees. 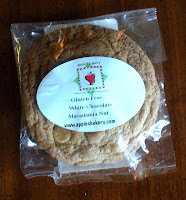 All free of gluten, fish, shellfish, peanuts, and tree nuts. They even created a separate menu for our special dairy-free “allergenista” table. 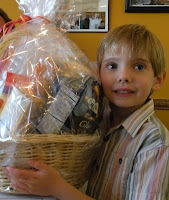 Our friends at Whole Foods Market supplied a fabulous gift basket for our free raffle, won by 6-year-old Matthew Perlman. It made me so happy when Matthew told me, “I love Safe & Sound Dinners!” That’s why I do these events; we all deserve to safely dine out and enjoy a delicious culinary experience among friends. Please join us for our next Safe & Sound Dinner at BOKA, date to be announced soon! 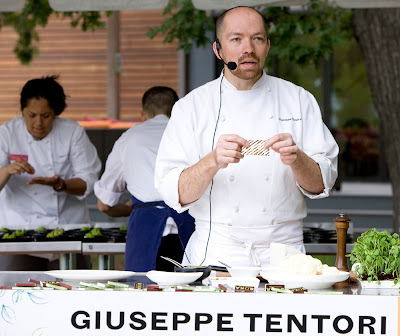 "New Chef Giuseppe Tentori transforms Boka into one of the city's best. The food has gotten spectacular."" See me in action on WGN tomorrow; September 10th at 12:45 p.m. central time, I will be making Julia Child’s Boeuf Bourguignon allergen free! I hope to one day aspire to the level of expertise of Julia Child, but I do share some interesting things in common with her that made me decide to make one of her dishes. Firstly, I started my career in cooking late in life, like Julia, I attend a Cordon Bleu School, like Julia and I am also at the top of my class. Now, the big difference between us, especially when it comes to French cooking is the use of butter, I don’t use any, or any other of the Big Bad 8 Allergens or Gluten! If you can’t watch, we will be sure to post the segment on the website. 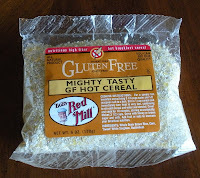 Next up is a breakfast favorite, Bob’s Red Mills Mighty Tasty GF Hot Cereal. I first tried this cereal when Bob sent me some samples for an event and I am so glad he did. I just love this cereal, it reminds me of Cream of Wheat, with a little maple syrup and rice milk, I am in heaven. Bob’s Mill is such a great company, look for my post testing their new corn based products, great stuff! 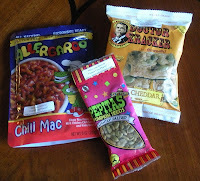 Learn more about this yummy cereal and other products by “Bob” at www.bobsredmill.com. I always have samples of this cereal with me at my cooking classes; make sure to ask me for some. Just a few tickets are left for our Safe & Sound Dinner at DaLuciano’s on September 12th, make sure you grab them before they are all gone! 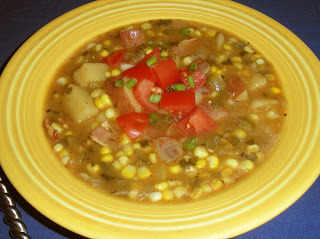 Yummy Corn Chowder and a Some New Ingredients to Consider…. I can’t believe our next Safe & Sound Dinner is right around the corner, Rosalia from DaLuciano’s has been planning for our big family style feast (3 appetizers, soup, pasta, 2 entrees and 3 desserts!) and our gift bags are overflowing, make sure you buy your tickets before space fills up! This recipe is from one of my favorite blogs I wrote about last week, The Whole Kitchen , I made some modifications to this recipe based on what I had in the house and something to add a different flavor. Jenn got this recipe from another blogger adding her own touches, it’s amazing how easily adaptable this delicious recipe is. Before we get started I want to share with you a pepper I learned about from Mark Mendez, Executive Chef at Carnivale - the Shishito pepper. 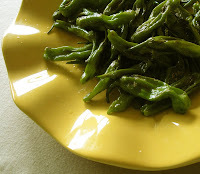 This Japanese pepper, is difficult to find, but if you find it, grab some, take them home and saute them whole in olive oil with a little salt and pepper and you will have a tasty treat you can’t stop eating, Jay’s watch out! No matter how large a plate I make of these peppers, it always empties quickly. Green Acres farm sells these at the Green City Market on Wednesday and Saturdays and can also be found in Evanston on Saturdays if you can catch them, they sell out fast. I purchased the ingredients for our corn chowder at the Green City Market, there is so much more flavor in these freshly picked items than their grocery store counterparts. 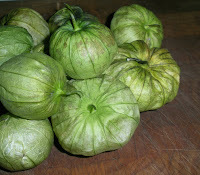 I also picked up some fresh tomatillos and can’t wait to share a recipe using these from a fellow student at the Cooking and Hospitality Institute of Chicago in my next post. Heat large stock pot over medium heat, add 1 tablespoon olive oil and heat another minute. Saute bacon until crispy, be careful not to burn, remove from pot and reserve. Drain excess bacon grease and leave about 1-2 tablespoons in pot. Add onion and celery and cook until soft, onions will become translucent. Add thyme, oregano, basil, paprika, cumin, chili powder, salt, pepper and celery leaves to pan and thoroughly incorporate. Reduce heat to low and sprinkle GF flour over mixture and mix thoroughly. You want to cook the flour for about 5 minutes to remove flour taste. French cooking terms – you will notice that at the bottom of the pan some remnants of the items you just cooked are forming at the bottom of the pan, in French cooking this is called suc or fond and you want to have these bits in your dish, not sticking to the bottom of the pan, so the process to loosen these bits is called deglazing and you can do it with any acid based ingredient (vinegar, lemon/orange/lime juice, or tomato or wine). For our chowder, we are going to use white wine. Push vegetables to side of pot and add wine, you will notice as you stir the ingredients the fond will start to loosen from the bottom and add wonderful flavor to your dish. Reduce the wine au sec (almost dry) and then add chicken stock and water. Stir in corn kernels and reserved cobs. The cob is filled with flavor. Increase heat and bring chowder to a boil, reduce to a simmer and cook covered for 30 minutes. Remove cobs before serving and top with garnishes, enjoy! 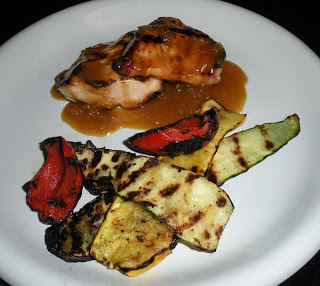 Grilling Honey Mustard Chicken and Other Blogs that Really Cook! With the Labor Day weekend quickly approaching, I thought you would enjoy some great dishes to share with family and friends on the grill. My mother-in-law and sister-in-law have wonderful gardens and were kind enough to send some fresh picked zucchini and squash home with us to make a great side for our chicken. 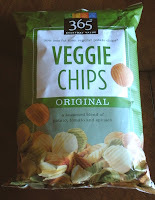 Before we start with the food, I want to share with you some blogs I really enjoy. Since I eliminate the “Big, Bad 8” and gluten from my recipes, I thought it would be good to share some blogs that focus on specific dietary restrictions – this time the feature is gluten. 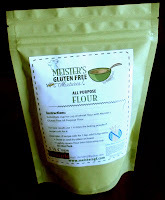 The first blog is a great new friend to the allergenista community, Gluten Free Betsy, she has a wonderful blog. I personally love her allergen free travels around the south side, it is creative, resourceful and I can’t wait to follow her travels around my old stomping ground. 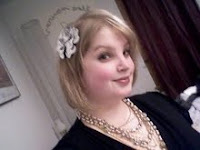 Gluten Free Betsy is a personal blog of a hip, twenty-something Chicagoan dealing with celiac disease and living a gluten free lifestyle for the past ten years. 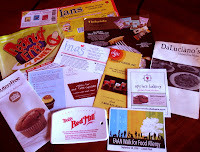 Gluten free product reviews, restaurants with gluten free menus, gluten free recipes, and gluten free/celiac news and events are discussed. Betsy really delivers, this blog is a definite must visit! The second blog that should be on our list is from an old friend. 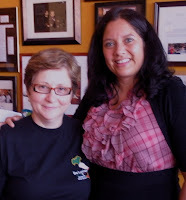 About 5 years ago, I used to own a Minuteman Press Franchise and Jenn Sutherland was one of my clients. When we went out to eat, I was always amazed that Jenn ate gluten free, I couldn’t at the time imagine giving up the things that had become Jenn’s lifestyle, funnily enough she suspected I might have issues with gluten since I shared with her that I always felt run down. It’s such a small world! The Whole Kitchen is a great resource for gluten-free recipes, I’ve noticed that many of her recipes can easily modified to be free of many of the Big, Bad 8! 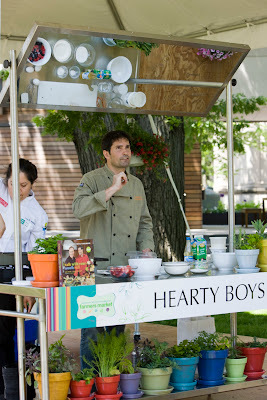 It has been so nice to reconnect with an old friend with a new common passion, in fact we plan to get together and cook, soon I hope! I always am so hungry after visiting The Whole Kitchen… you will love this blog! Since I go to a French cooking school (the Cooking and Hospitality Institute of Chicago ), I thought through my posts I would start sharing with you terms that rule the French kitchen. The first one is “Mise en Place” or everything in its place. This term is the basis for every recipe in that everything you need to cook your dish should be prepared and measured out in advance. Before I went to school, I would start the onions cooking and try to mince the garlic while the onion cooked, this never worked well and made the cooking process more stressful then need be. By having everything ready, you can focus on building of flavors in your dish, trust me, if you aren’t doing this already, it will change the kitchen for you! Heat saute pan over medium-high heat. Add onion and sauté until onions have some color, about 3 minutes. Add garlic and pinch of Kosher salt and pepper and sauté 2 minutes. Make sure not to burn garlic. Add white vinegar and let reduce for 30 seconds and add honey and vinegar. Bring sauce to a boil and then reduce flame to simmer for 5 minutes or until sauce thickens. Reserve ¾ of sauce to top finished chicken, take remaining sauce with you to the grill. Heat grill on high flame for 10 minutes. Take a paper towel with canola oil on it and rub it over the grill, heat grill another minute. This is what is called seasoning the grill, it makes the cooking surface like a non-stick surface. Turn grill down to medium. Put chicken on grill, you will see the chicken start to cook and come up the side of the breasts. Once the chicken is 2/3rds done on the first side (about 5 minutes) turn. You will notice beads of sweat forming on the top of the breast. Brush honey mustard sauce on chicken breast. Cook 2nd side about 3-4 minutes. Turn chicken again, add sauce. Turn again and let sauce cook 1 minute. Use reserved sauce to top chicken breast. Add all ingredients and mix thoroughly. Take a paper towel with canola oil on it and rub it over the grill, heat grill another minute. This is what is called seasoning the grill, or making the cooking surface almost like a non-stick surface. Grill veggies 2-3 minutes per side until tender with nice grill marks.